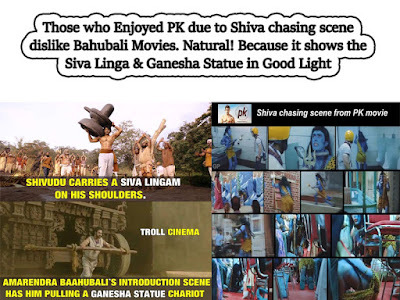 The best revenge to movies like Pk is to make more and more movies like the Bahubali franchise.Attacking the screen or creating violence in movie halls will only results in making it more successful.By the way I enjoyed the Pk movie as a whole and made sure not to go to cinema hall and donate money to the producer. Litty Annu Thomas: PK is a satire movie. Please do check out d meaning of 'satire'.Period cinemas r always beautiful movies with amazing sets, godliness, emotionally loaded, beautiful men and women. Comparisons cannot b done between period cinemas and satire ones.Den we shd b purely talking abt cost involved in making d movies, its collection rates etc.....it shdnt b abt 'revenge', attacks etc.We twist everything emotionally, den come up with some technical reasons to justify d emotional substance of d matter. It's not about twisting anything.My point is not dat, if u see everything from religious point of view, u will still live in d same circle of life. Prosperity will not happen. Why relate EVERY feeling or incident to a religious sentimental feeling. Wat I felt is comparing gross collections based on content of d matter shd not b a concern.Half d time we preach abt wat is wrong with religion, and justify our own religion. Instead of getting out of dis circle, we all love being in it. Life is not ALL abt religious sentiments alone.He did tease Islam as well in PK subtly.Mr. VIPIN....ur content on d issue is different, mine is different. So lets leave it dat. I can't pinpoint d exact scene in d movie. But both movies are 2 poles apart and it cannot b compared in any manner.okkk. Maneesh Jayachandran: We are comparing the first and fourth highest grossing indian films with the third highest grossing indian films at the present time.We started analysing this way after inspiration from liberal anti hindu journalist shani prabhakaran and many others according to whom puli murugan is a celebration of hindutva.We didn't find any in the movie.We are a bunch of pagans who do not want prosperity by doing conversion to semitic folds.We love being in our circle tolerating the intolerant liberals.Now that the pulse of the indian audience is loud and clear. It is up to the movie makers to take the plunge.We publish such posts because we know why kairali tv is telecasting dubbed pk movie every now and then.